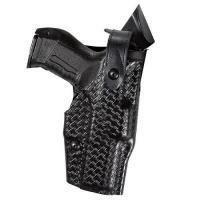 Safariland 6365 ALS Level III Plus Belt Slide Drop Holster FREE SHIPPING! The ALS® system is the next evolution in retention holsters and builds upon the successful SELF LOCKING SYSTEM (SLS). With many patents to its credit, the key to this system is an internal locking device that secures the weapon in all directions simply upon re-holstering, providing Level II Plus Retention® which can also be elevated to Level III Plus Retention® with the addition of the Sentry. Awesome holster. The only thing that keeps it from being 5 stars is that I never use factory sights and the rotating hood always has minor glitches with this. This is the best holster I've used in my career to this point. The draw is fast, smooth and natural, but it still provides a high level of retention. I highly recommend this holster. Will this holster fit the Boston Leather Riverside 2.25" belt? ©2002-2019 CopsPlus.com: Safariland 6365 ALS Level III Plus Belt Slide Drop Holster FREE SHIPPING!